The centre seats of the Business Class cabin, private or share the space, it’s your choice! Originally by Dominique Afacan, one of our DesignAir judges for forbes.com. She talks business, beds and Boeing with Roberto Abbondio, Head of Sales and Marketing UK/IR for Cathay Pacific. Cathay just won Best Business Class in the Airline Ratings.com awards – how does the cabin differ to the previous offering? It is a brand new concept. The thing we are very proud of is that while developing this new business class concept, we took into consideration comments from our frequent flyers, which helped to refine the product. Each seat has direct aisle access and has been designed to give passengers a perfect view through the windows. The seat quickly converts into a bed that is one of the longest and widest provided on any commercial airline. A novel feature called the ‘Bed Extension’ deploys automatically as the seat transforms into a bed, increasing its width. Tell us about the menus and how you construct them? 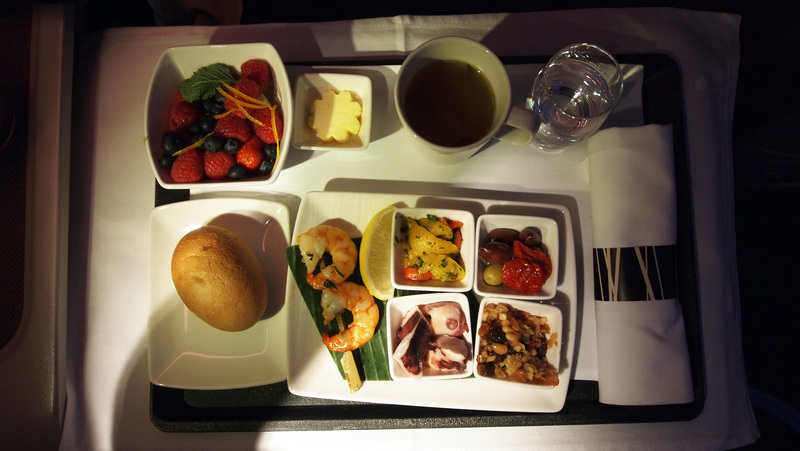 Our customers are used to eating in the best restaurants around the world, so taste, authenticity and freshness of our in-flight meals are essential. The menu planning team at Cathay Pacific create a menu to suit the demographics of the passenger, so a regional dish will be always found on the list of menu options along with our renowned signature Chinese dishes. The selection of wines offered regularly feature in the Cellars In The Sky Awards, most recently in 2012 and 2013 achieving accolades in various categories including Best Business Class Red and Best Overall Wine Cellar. And the entertainment in business class? 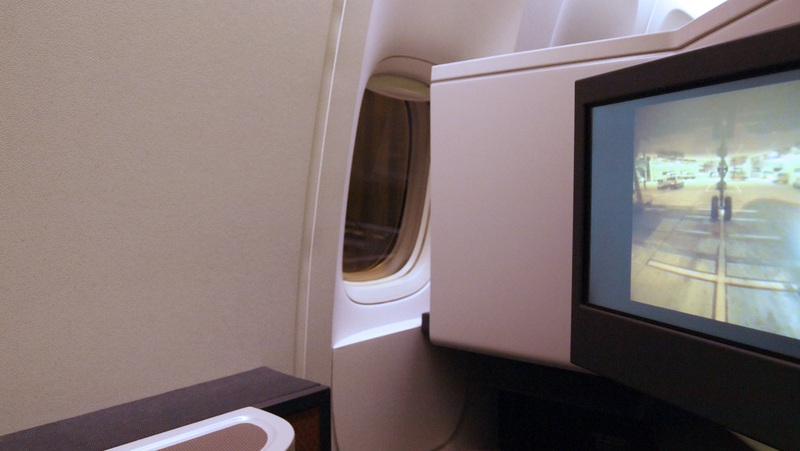 Passengers enjoy a 15.4 inch touch-screen personal TV. Our award-winning StudioCX features a rotating library of 100 movies, 500 TV shows, 888 music CDs, 22 radio channels, and 70 games. The entertainment control panel now includes a multi-port connector that lets you connect your own electronic devices, including the iPod and iPhone, and stream audio and video content to your personal TV display – which you control through your own device. There is also a USB port for charging mobile devices. Conde Nast Traveler just wrote a positive piece about your business class amenity kits – what do they contain? 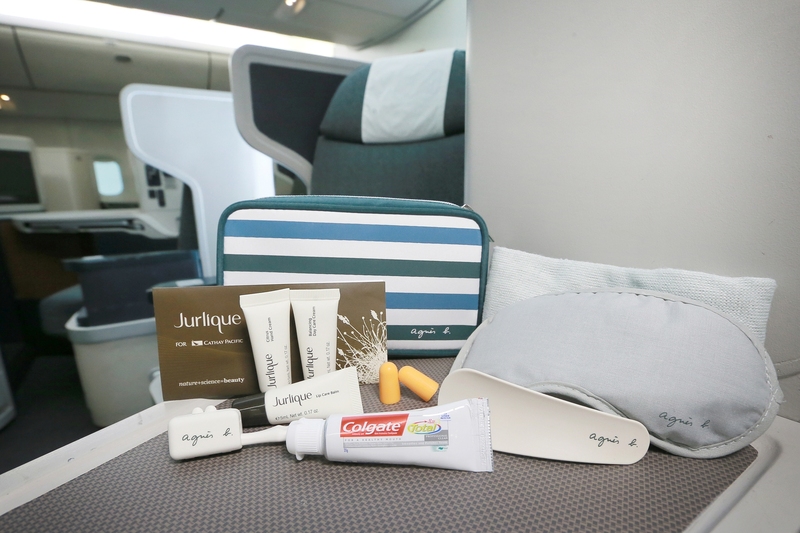 Cathay Pacific’s new range of amenity kits for long-haul Business Class travellers feature products from Jurlique, a renowned Australian natural skincare brand. We are very excited about this collaboration. Jurlique has been investing in natural skincare science for many years and we think they are a great fit with our brand. The products are packed in a pouch exclusively designed by agnès b., with whom Cathay Pacific has partnered since 2007. 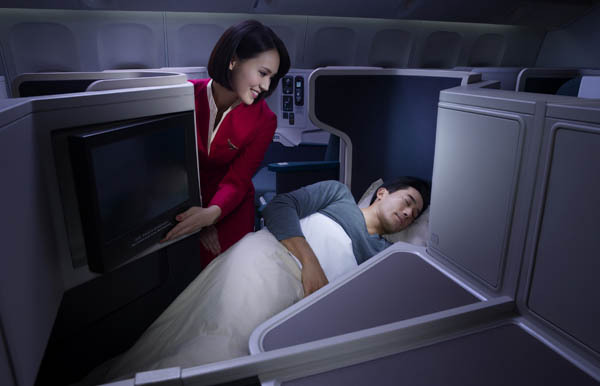 All HK-London flights will now be on Boeing 777s – we heard the new first class cabin refresh will be completed by the end of this year for this model? Yes. In July last year we unveiled a newly refreshed First Class product which features a significant enhancement to the cabin’s look and feel along with the introduction of a number of new features. 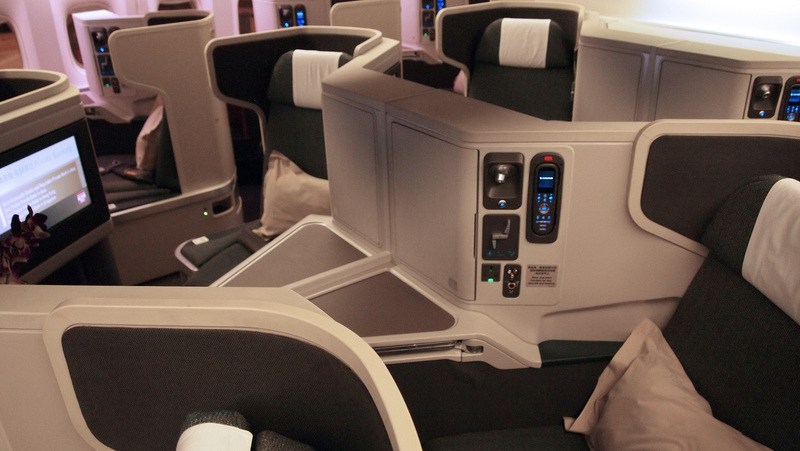 The first Boeing 777-300ER aircraft with the upgraded First Class entered service in July 2013 and the entire cabin refresh project is scheduled to be completed by 2014. Are there any plans to acquire any A380s or other double decker jets? Cathay Pacific’s fleet mix of A330s, 777-300ERs and future A350s and 777-9X suits our business requirements. The 777-300ER, 777-9X and the A350-900 /A350-1000 will form the core of our long and ultra long haul fleet. We will continue to evaluate all available aircraft models for our fleet needs, but this is subject to airline needs. What else is on the cards for Cathay in 2014? We will continue to develop the Cathay Pacific and Dragonair networks. The focus will be on strengthening frequencies where possible and getting the short-haul and long-haul networks more evenly balanced. We are progressively rolling out our refreshed First Class cabin which as mentioned is due to be completed in the third quarter of 2014. We will launch a new daily service between Hong Kong and Newark Liberty Airport on 1 March, and will operate more flights to Los Angeles and Chicago.